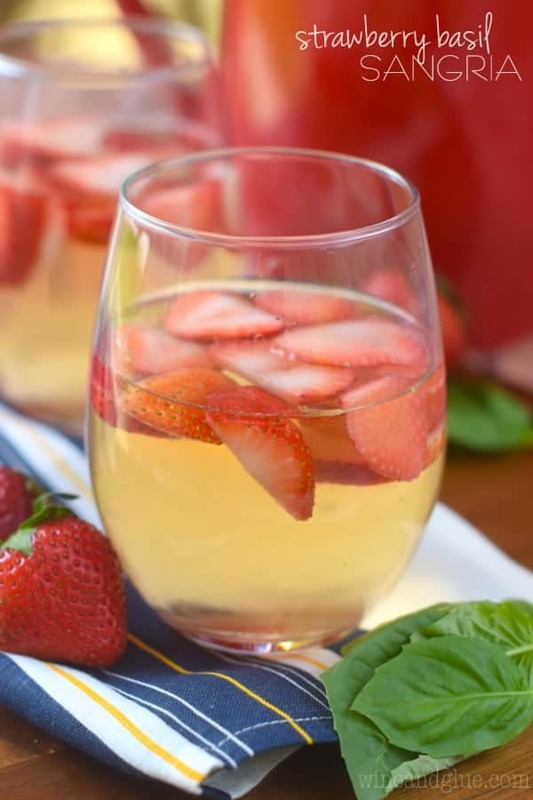 Such a perfect and easy summer cocktail! 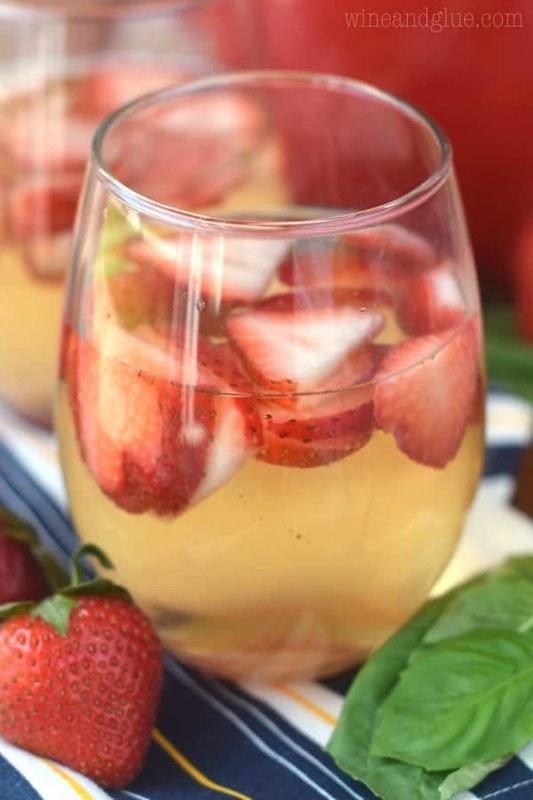 This Strawberry Basil Sangria is exactly what your summer BBQ or picnic needs! Did you have a good holiday weekend? We WORKED. We pulled weeds, bushes, edged, and spread mulch. Whenever we spend weekend time doing stuff like that we feel like such grown ups afterwards, because let me tell you, I would have done almost anything to not do that but instead lay on the couch and watch reality TV like my 20 something year old self. Jerk past Lisa. She had it good. While we worked, the kids “helped.” What’s weird though, is them “helping” sounded an awful lot like us screaming at them every two minutes to not eat dirt, get off the mulch pile, and not impale their siblings with the pitch fork. Strange, right? I think they were so excited because they love the idea of gardening. They like the idea of picking things from the garden and eating them . . . the pulling of weeds, eh, not so much. Shoot. I might know where they got that from. There are so many things that I love to grow in the summer, but I think my favorite might be fresh tomatoes and basil. They remind me of when we landed in Italy and ordered a big giant plate of fresh basil, mozzarella, and tomatoes. It could have just been because I hadn’t eaten in like 80 million hours, but it was the best thing I have ever eaten. So I love the idea of recreating that at home. Ooooorrrrr . . . you know, you can just use the basil to mix up some amazing cocktails! I’m obsessed with the strawberry basil flavor combo. Like with this butter and this mojito. And now this sangria! Make the basil simple syrup by bringing the sugar and the water to a boil over low heat, stirring regularly. Once the sugar is completely combined, add the basil leaves, and allow to cool completely. 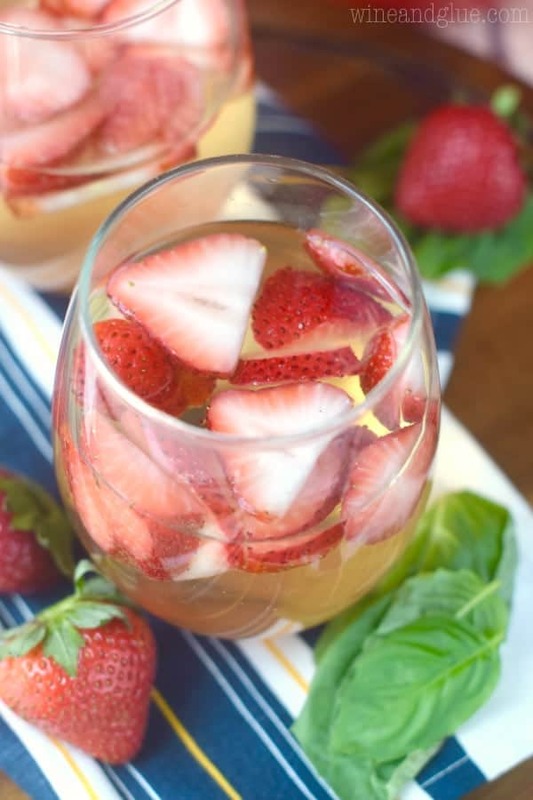 Combine the riesling, basil simple syrup (with leaves removed for a clearer color), strawberries, and rum. Refrigerate about 8 hours before serving. Oh, the days B.C. (before children). Past Mir was lazy and didn’t even let it bother her. Now a holiday weekend needs to be a time to get things done. When did this happen to us?! 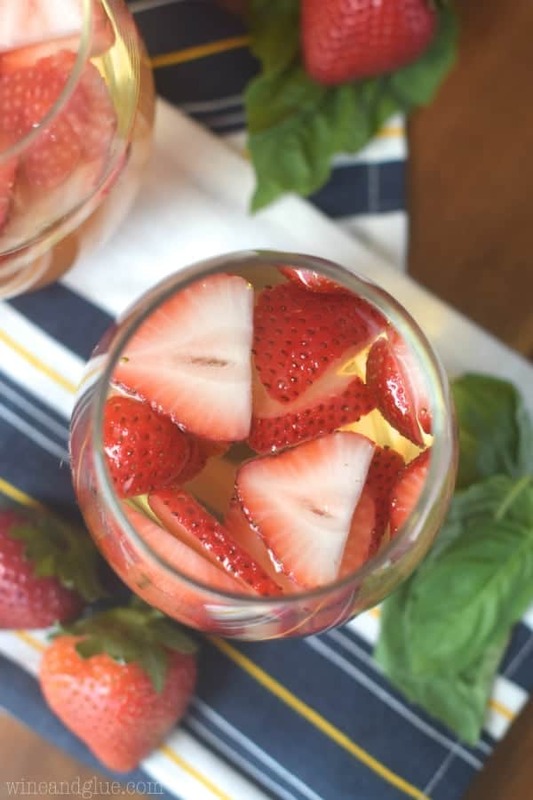 I am in love with basil in sangria, so this is just the happiest of drinks! Maybe I should down some to be less productive?